City Kids, City Teachers—now reissued with a new introduction by William Ayers that reflects on how improving urban education is more essential than ever—has become a touchstone for urban educators, exploding the stereotypes of teaching in the city. In more than twenty-five provocative selections, set in context by Ayers and Patricia Ford, an all-star cast of educators and writers explores the surprising realities of city classrooms from kindergarten through high school. Contributors including Gloria Ladson-Billings, Lisa Delpit, June Jordan, Lewis Lapham, Audre Lorde, and Deborah Meier move from the poetic to the practical, celebrating the value of city kids and their teachers. It is a useful guide as well as a call to action for anyone who teaches or has taught in the city, for those considering teaching in urban schools, and for every parent with children in our schools today. Patricia Ford is the executive director of the Steans Family Foundation. 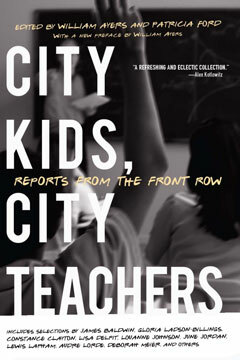 She is a co-editor (with William Ayers) of City Kids, City Teachers: Reports from the Front Row (The New Press).